Born in Queenstown on Tasmania’s west coast, Birchall began his football career playing underage and eventually senior football with Devonport. After playing Under 16 football with the Tassie Mariners from the age of 14, Birchall was chosen in 2004 to represent the Mariners in the TAC Cup Under 18 competition under coach Hamish Ogilvie, and the following year he represented Tasmania at the National Under 18 Championships, winning the Harrison Hunter Medal as the Best and Fairest player in Division Two of the tournament. His performances attracted the attention of the AFL, and at year’s end he was selected by Hawthorn with Pick 14 in the 2005 National Draft. Debuting in Round One, 2006 against Fremantle in Launceston, Birchall played 16 games in his first year at Glenferrie and impressed from the word go in a side that only won nine games. He earnt an AFL Rising Star nomination in Round 14, won the Hawks’ Best First Year player award, and ended the season with a sensational 36-disposal performance against Geelong. In the following years, Birchall cemented himself as one of Hawthorn’s first choice back six, using his 193cm height and deceptive pace to repel attack after attack by opposition teams as well as initiating countless scoring runs for his own side. Always at his best on the big occasion, Birchall was a consistently brilliant performer in finals, and his 23-disposal, 12-mark performance in the 2008 grand final against Geelong was a major factor in the Hawks’ upset win. While superstars Sam Mitchell, Luke Hodge and Lance Franklin garnered a large portion of the praise and accolades during the Hawks period of dominance, Birchall was one of the side’s quiet achievers. This did not go unnoticed by the football community, and Birchall was recognised with an All-Australian jumper in 2012 and with selection in the International Rules squads in 2014-15. His consistency was also recognised by his own club, with Birchall placing in the top ten in Hawthorn’s Best and Fairest award in seven of his first ten seasons, including three ‘top three’ finishes. 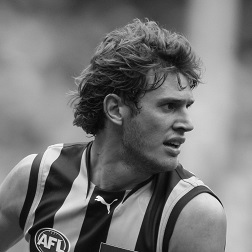 By now a member of the great Hawthorn half back line of Birchall, Gibson and Hodge, Birchall was a crucial cog in the Hawks’ premiership hat trick of 2013-15, in the process joining an elite club of four-time VFL/AFL premiership players and becoming – along with Royce Hart, Brent Crosswell and Rodney Eade – the most decorated Tasmanian footballer of all time in terms of VFL/AFL flags won.